Another week has zoomed past us, along with Halloween. We are now into the anticipatory time of year. Amber seems to be in a constant state of holiday excitement and it is only Nov. 1st! This was a productive week school-wise and project-wise for us both. It did have the potential to be a small disaster, but with Amber's cooperation we managed to finish all of the designated school subjects and assignments for the week. Monday, I had a doctor's appointment at the hospital near my mom's house, so Amber had Grandma homeschool and playtime for most of the day. It was one of those appointments where you know the doctor will be behind, by hours sometimes, just for your 15 minute checkup, except I'm never a 15 minute checkup due to a previous medical situation. I arrived back at Mom's to find Amber's work all neatly finished, and the two of them enjoying a rousing game of Pig Pong, an old game belonging to my sister. always been a little bit cut-throat, and always competitive. The remaining days this week have very nearly been "regular" school days. 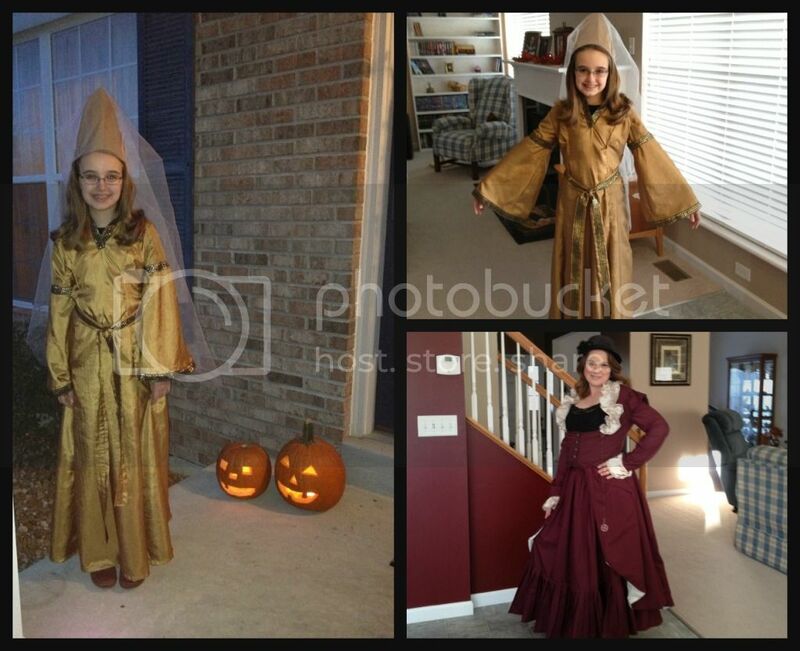 Yes, Halloween was Wednesday and Amber spent the school day in her medieval princess costume, but quality schoolwork was completed, including Latin. Amber did enjoy occasionally commenting how the kids at her old school would not be wearing their costumes playing Webkinz during lunch break. Apparently, there was something special at Webkinz if you logged in ON Halloween. After deciding to simply trick-or-treat in our subdivision, instead of the many party options we had, Amber ended up declaring it the "best Halloween ever". Wonder why we bothered with other stuff all the previous years? and accessories. It is a royal looking gold dress. She wore it all day, even to Target. pounds heavier, no joke. Not the best idea on a candy eating day. It is a very heavy costume too. My main worry about this week was that our Friday catch-up day is missing. Fred has another follow-up at Barnes, so Amber is spending the entire day with my mom, again. They have great plans for the day, and it doesn't include finishing work that fell behind. Thankfully, we stayed on task. Whew, load off my mind. Amber has also finished the election study and the selected lap book projects that accompanied the unit study. All in all, she learned a lot, and had fun. I do really wish so many of the links were not broken, forcing us to find our own websites to view the topics. That really is the point of a purchased unit study, not having to find the links yourself. But, oh well. I will definitely reconsider using purchased studies in the future. sealed Mom's deck last weekend. 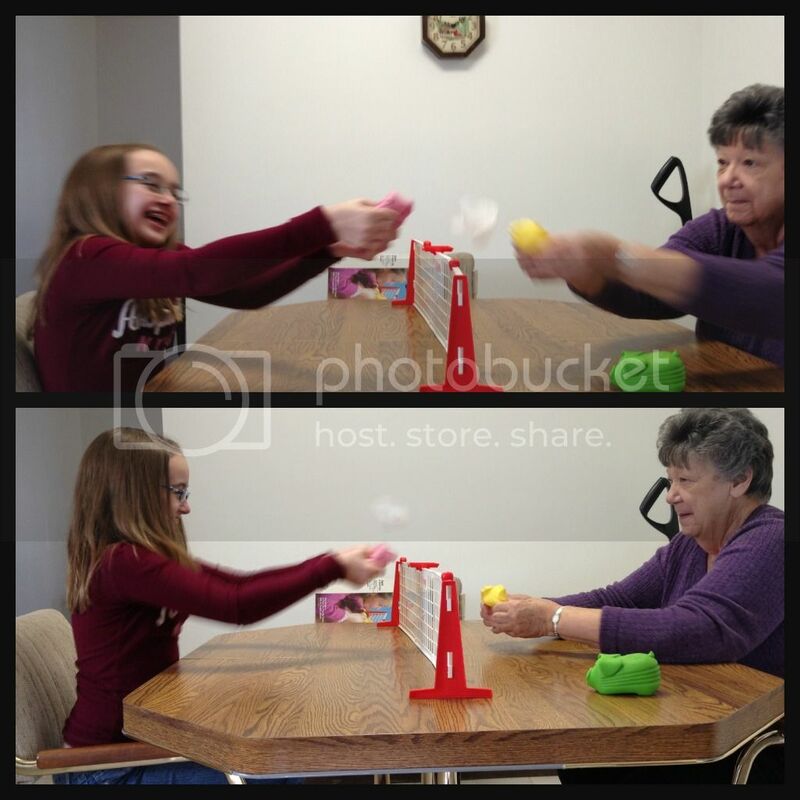 It is a stressful and competitive game, especially with all the dipsand curves in the table. Amber loves to dress up at my Mom's house. It's a tradition! 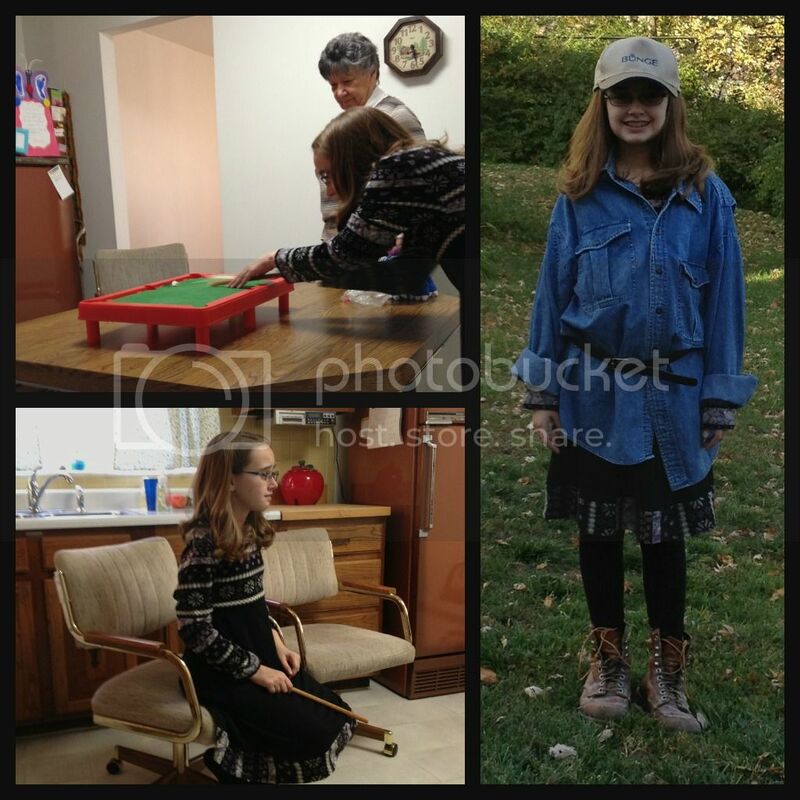 For the first time, she used my dad's things.His old, steel toe boots, denim shirt, belt and hat. On that topic, I finally decided what to use for a fun study theme after Thanksgiving. We, of course, will be working on an Advent study in religion. But I also wanted to try and make some of the other subjects fun and Christmas / Winter themed. We already planned to read and study Dicken's A Christmas Carol for literature, writing and history class, but that is scheduled for only 6 or 7 days. It does include studying the Victorian time and some fun projects, but really it won't last longer than 7 days. I did purchase this study, very cheaply, at the beginning of the school year at Currclick. I am very pleased with it though, and it isn't dependent on a lot of website links. Then, thinking about Amber's Christmas dance recital made me look up the Nutcracker ballet, because Saint Louis Ballet has performances every December. We now have tickets for the ballet and a basis for a second, fun, pre-Christmas study! Based on the performance date, we need to work on the Nutcracker study before A Christmas Carol. I found some great online study recommendations and ideas for the Nutcracker. I've posted our loose outline for the Nutcracker study. I did purchase a few cheap books from Amazon, but it wasn't entirely necessary. Our library had most of them, I'm just too lazy to request the books and hope nobody else requests them for the time period we want them. We also started a Thankfulness tree that Amber and I are adding a leaf to, each day before Thanksgiving, with the things we are most thankful for that day. We've opted to include this in during religion time, since it is appropriate. Fred is certainly welcome to join us, but as he isn't home most of the day, he is excused from the project. Each week I'll try to give a short summary of our thankful items. I get regular email updates from the Painted Pot and they are just about to start a 6 week, once a week, art workshop style class using all the various mediums available in their store. Amber jumped, literally, at the idea and since it was on her ONE free evening during they week, she is now signed up. Seriously, the child is insanely busy, but so much more relaxed than when she was in parochial school. We love it! That has been our almost normal, still busy, Halloween celebrating, Grandma visiting, Christmas-study planning week. It was great. Have a wonderful weekend and enjoy November! I don't know where to start Christy. I love all the things you did. I love the Pig Pong with your Mom. I have never heard of that but will definitely be on the lookout. Love the costumes. Yours is wonderful! WOW! Sounds like you had a great Halloween. 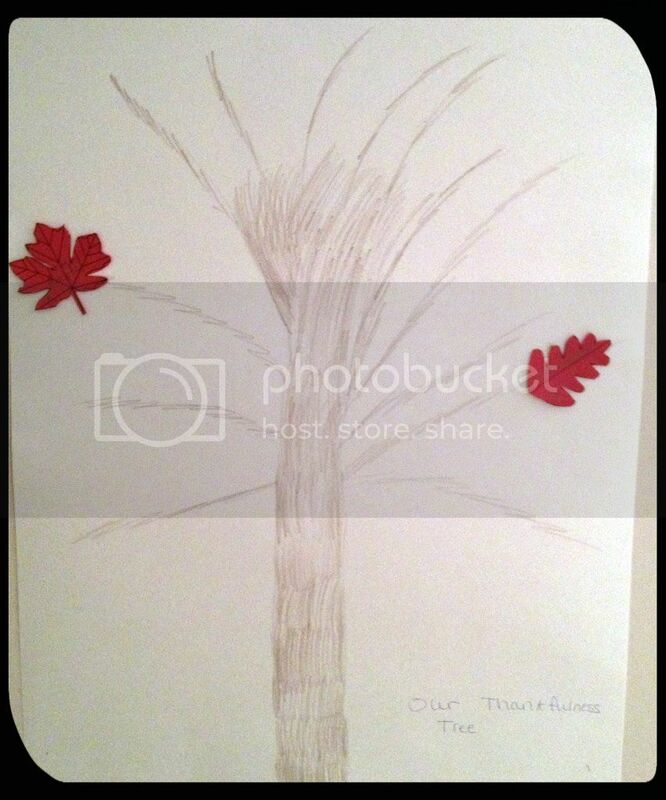 We are doing a Thankful tree too! Also Amber got some great learning in! I love weeks like that. Have a great weekend Christy.